Not to be confused with Holden Commodore. The Opel Commodore A was manufactured from 1967 to 1971, based on the Rekord C. After having offered a Rekord-6 powered by a 2.6 L 6-cylinder engine since March 1964, Opel in February 1967 launched the Commodore as a faster up-market version of the Rekord. The Commodore was initially available with the known A 2.2-litre six or a larger 2.5 L engine developing 115 PS (85 kW; 113 hp) with a single carburettor. Body styles comprised a two-door or four-door notchback saloon and a two-door hardtop/fastback coupé. In September 1967 the sporty Commodore GS offering 130 hp (96 kW) from a dual-carburettor 2.5 L-six was introduced. For the 1969 model year, the carryover 2.2-litre six was dropped and the optional 2-speed Powerglide automatic was abandoned in favor of Opel's new 3-speed automatic transmission. From September 1969, the base 2.5 L-engine was pumped up to 120 PS (88.3 kW; 118.4 hp); at the same time, both remaining engines received hydraulic lifters for smoother running, a new exhaust system and six camshaft bearings. The handbrake lever was moved from its position under the dash to a location between the front seats and the fuel tank was enlarged from 55 to 70 litres. An even more sporty model than the GS, the Commodore GS/E, debuted in March 1970. It had a 2.5 L engine equipped with Bosch D-jetronic fuel injection system developing 150 PS (110 kW; 150 hp), which gave the car a top speed of 197 km/h (122 mph). The Commodore GS/E also had a career in motorsports, with a car prepared by Steinmetz. In April 1970 a Commodore with a detuned and carburetted 2.8 L-six giving 145 PS (106.6 kW; 143.0 hp) followed (GS 2800). 156,330 Commodore As were built, including 2,574 GS and GS/E variants. The Commodore A "V body" platform was used by GM to produce other models in many markets, these include the GM Ranger sold in mainland Europe and also in South Africa together with the GM Opala which was built and sold in South America from 1968 through to 1992. The Opala has a very big following in South America. Their production commenced two years after the Commodore A debut in 1966. Today the name Commodore is a name synonymous with GM Holden of Australia. However, that wasn’t always the case. The first-generation Holden Commodore actually is equivalent to the third-generation Opel Commodore. All engines for the Commodore were 12 valve, CIH straight-six engines ranging from 2.2 to 2.8 litres. All but one engine option had single-barrel (2.2) or double-barrel (2.5; 2.8) downdraught carburetor. in 1970 the GS/E model was introduced which as it's badge implies didn’t utilise carburetors. The "E" meaning Einspritz or injection in English. Opels didn’t have the reputation for performance cars in the period and they had seen the positive impact on sales for other race winning manufacturers on having performance models in their range of cars. Opel wanted to be in this area of the market and the results of this desire was the Commodore GS/E. The carburettors were ditched in favour of a Bosch D-Jetronic, Bosch's first commercially produced electronic fuel injection system. Bosch D-Jetronic was a very early version of multi-point EFI, the “D” stood for “drucksensorgesteuert” (pressure sensor regulated). Unlike later Bosch fuel injection system, the injection was direct to the cylinder instead of via the Plenum inlets, which meant the a specific cylinder head was manufactured specifically for the engine, making this model unique and expensive to produce and purchase. Different from older mechanical injection systems, it incorporated taking input from the pressure inside the intake manifold. This is known as the Air Mass Sensor or in modern terms this would be known as the MAP-sensor (manifold absolute pressure), a part that’s commonly found in more modern vehicles. Bosch sold the patent to Japanese companies that continue to produce injection systems based on D-Jetronic. D-Jetronic fuel injection was installed onto the 2.5 litre engine with the modified cylinder head, increasing power by 20 bhp (15 kW), making it more powerful than the larger 2.8 litre engine. The fuel injected engine, named 2500 E, now produced 150 hp (112 kW; 152 PS) at 5,800 rpm and 196 N⋅m (145 lbf⋅ft) of torque at 4,500 rpm with an unchanged compression ratio of 9.5:1. For comparison, the base model Porsche 911T in 1970 had 25 PS (18 kW; 25 hp) less, but was more expensive. The GS/E could accelerate from 0–100 km/h (62 mph) in 9.5 seconds, a similar value to the same period Porsche 911. It could also reach a top speed of 192 km/h (119 mph). The GS/E Coupe model is known affectionately as the "German Charger". 150 bhp at your right foot ... power to kick you ahead. Acceleration that pushes you into the seats. Six cylinders that receive their fuel served electonically. An engine that doesn't let a single octane go to waste. GS/E: a lurking grumble in the two exhaust tubes. The Commodore B was based on the Rekord D, and launched in 1972. As in the previous generation, four models were offered: 2500 S, 2500 GS, 2800 GS and 2800 GS/E, as a four-door notchback saloon and two-door hardtop/notchback coupé (although the fastback design was replaced by a more conventional three-box design). Power of the 2.5-litre engine was 115 or 130 PS (85 or 96 kW; 113 or 128 hp) depending on the specifications (25S/25H), while carburetted 2.8-liters had 130 or 142 PS (96 or 104 kW; 128 or 140 hp). The fuel injected 2.8 used in the GS/E has 160 PS (118 kW; 158 hp). The Rekord and Commodore were also assembled as CKD kits in Belgium and Switzerland in the 1970s. These cars carried the name Ranger and differed from the originals in having different grilles and trim. These cars were exported to various countries. In 1974, due to new regulations regarding pollutant emissions, the 2.5 L base models were dropped and the 2.8 L was detuned to 129/140/155 PS (127/138/153 hp). Commodore B production ended in 1977. The Commodore B series was like the A series briefly used in motorsports, and the extreme "Jumbo" Commodore raced in the 1974 "interserie". It used a 6.0-litre V8 engine and had large wings which almost made it unrecognizable as an Opel. It never enjoyed much success despite of its massive powerplant and impressive output. Opel Commodores were also built in Iran between 1974 and 1976 under the name Chevrolet Royale 2800 and 2500 with both 2.5 L and 2.8 L engines by Pars Khodro (General Motors Iran). The first Royale, also the first Chevrolet car built in Iran, left the production line on 15 January 1974. The Royale sold well initially, but the car had not been re-engineered for Iranian conditions and the low ground clearance coupled with carburettor troubles led to its reputation quickly being tarnished. The car was withdrawn by early 1977, replaced by Buicks, Chevrolets, and Cadillacs of American origins. It was also assembled in South Africa, where it was called the Chevrolet 2500, 3800, and 4100, and was a top seller in that market. These received inline-four or -six engines of Chevrolet origins, built locally. The Commodore C was first shown in late 1977, at the same time as the Rekord E. It only entered series production shortly after, however. The South African version of this car, the Chevrolet Commodore, was actually ahead of the European original model to enter production, in September 1978. The Commodore continued to be a larger and more luxurious version of the Rekord. There was no coupé version of the Commodore C, as it was replaced by the Opel Monza, the coupé version of the Opel Senator, but a two-door notchback saloon was briefly available. The single engine used by the Commodore in Europe was the well-known straight-six 2.5-litre unit with 115 PS (85 kW; 113 hp) or 130 PS (96 kW; 128 hp) when fitted with fuel injection. The Commodore was never a success, occupying an uncomfortably narrow niche between the Rekord and Senator. Another concern was the fuel mileage, with a fuel injected Commodore taking considerably more fuel than the larger three-liter Senator. The outdated engine also had little torque available at lower engine speeds, and was noisy. The new model featured a similar front end to the larger Senator. It was sold in the UK under the name Vauxhall Viceroy, with the Viceroy being a slightly more luxurious version of the Carlton. There was an estate version (dubbed the "Voyage" in Germany) offered in the Opel range from 1979 to 1982, which became a mainstay in the Holden range in Australia, and was also available in the Chevrolet range in South Africa. It was never offered by Vauxhall in the UK as a Viceroy, although a one-off estate car was built in 1981 for Queen Elizabeth II, for her to carry her Corgi dogs. The car still survives today, one of only 15 Vauxhall Viceroys left registered in the UK, as of 2006. The Commodore was dropped by Opel in Europe and absorbed into the Rekord range of 1983. It is this model which the early Holden Commodore models were based on, introduced in late 1978, and eventually replaced (after several facelifts) in 1988, with the VN Commodore, a model based on the then-current Senator and Omega models. It was the Opel Commodore and Vauxhall Viceroy that formed the basis for the first Holden Commodore in Australia, and was sold in South Africa as the Chevrolet Commodore until 1982, when it was rebadged as an Opel. The South African Commodore was introduced in July 1978, at the same time as the Rekord E went on sale there. These originally had Chevrolet engines, pushrod inline-sixes of 3.8 or 4.1 liters. Sold as a standard or a GL (with the 4.1 only available as a sedan with automatic transmission), the South African version replaced the earlier Chevrolet 3800 and 4100, also based on the Commodore. However, in South Africa, Delta (formerly General Motors South Africa) offered a revised version of the Commodore until 1986, again combining the bodyshell of the Rekord with the front end of the revised Senator. It was also sold there with the same 3-liter inline-six, producing 180 PS (132 kW). ^ Zink, Günther (2009). "Oldtimer Katalog" (in German). 23. Königswinter: HEEL Verlag GmbH: 262–263. ISBN 978-3-86852-067-5. ^ The 2239 cc engine with which the Commodore was launched shared its 82.5 x 69.8 mm cylinder dimensions with the four-cylinder 1492 cc Rekord engine on which it was based. The unit was first seen in the short-lived six-cylinder version of the Opel Rekord towards the end of 1966, but ceased to be offered in the Rekord after July 1967 when it became the entry level power unit for the newly introduced Opel Commodore. ^ Mazur, Eligiusz, ed. (2002). Katalog Samochody Świata 2003 [World Car Catalogue 2003]. Warsaw, Poland: Print Shops Prego - Polska Sp. z o.o. p. 226. ISSN 1234-8198. ^ Qasemi, S.M. (2016-10-05). "شورولت رویال؛ خودرویی که از آغاز به پایان رسید!" [The Chevrolet Royale: A car that was finished from the beginning!]. jamejamonline (in Persian). Archived from the original on 2018-05-02. ^ a b Wright, Cedric, ed. (August 1978). "New models: Chevrolet Commodore on its way". CAR (South Africa). Vol. 22 no. 7. Ramsay, Son & Parker (Pty) ltd. p. 14. ^ Sundfeldt, Björn (1982-01-13). "Ljuva livet på vägen" [Life of delight on the road]. Teknikens Värld (in Swedish). Vol. 34 no. 3. Stockholm, Sweden: Specialtidningsförlaget AB. pp. 16–17. ^ Mastrostefano, Raffaele, ed. (1985). Quattroruote: Tutte le Auto del Mondo 1985 (in Italian). Milano: Editoriale Domus S.p.A. pp. 186–187. ISBN 88-7212-012-8. ^ Lösch, Annamaria, ed. (1985). World Cars 1985. Pelham, NY: The Automobile Club of Italy/Herald Books. p. 332. ISBN 0-910714-17-7. 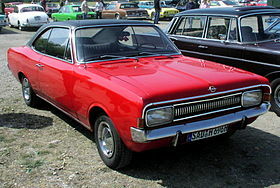 Wikimedia Commons has media related to Opel Commodore.